There is a problem in the map screen inventory arising from the reuse of the pInventoryPoolList vector, which is done for performance reasons. After rebuilding, we start a new game and cheat our way to the San Mona sector with the Shady Lady, which has multiple ACTION_ITEMs. 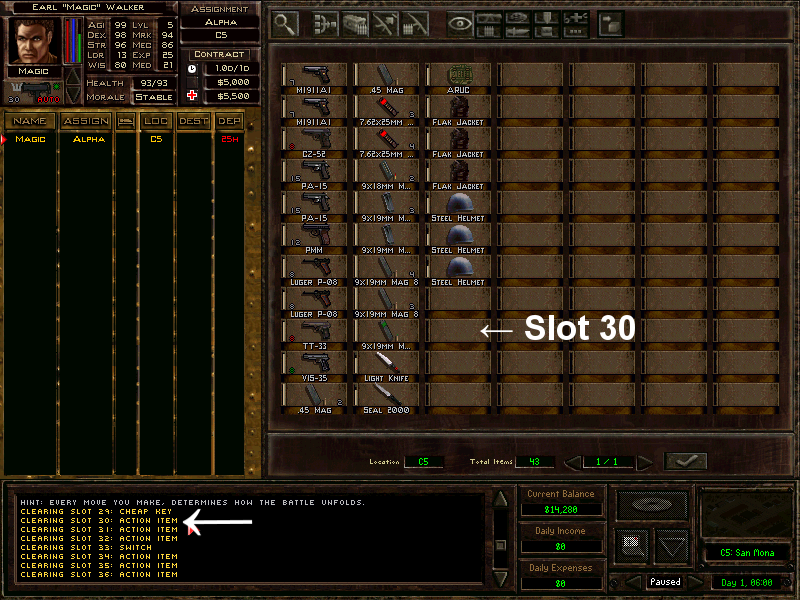 The first two empty slots (indices 29 and 30) used to contain a cheap key and an action item respectively. Action items, of course, are essentially invisible booby-trapped items that have the WORLD_ITEM_ARMED_BOMB bit set. I took a quick look at the code and the current implementation of "uiNumberOfSeenItems" doesn't make sense to me for an unloaded sector. So in the end we treat the item pool as if we see all items all the time? I have to debug this to really see what's going on which I cannot do at the moment. My assumption at the moment is that "pipl->usFlags = 0;" only needs to be set in the final for loop that cleans unused spots and "uiNumberOfSeenItems" needs to be decreased when we detect a hidden item. I ran into this problem on my plays. On WF maps in airport sector that I use as a place to store items, it would often happen that I can't combine some items and some magazines would not get merged into boxes/crates when ordered to. I couldn't make heads or tails of when it was happening and couldn't find reliable way to reproduce the problem so I didn't report anything yet. I did manage to make out that certain item slots would cause items to start behaving like that. Sometimes, just moving those items to another slot would 'fix' them but it didn't happen 100% of the time. The bug mentioned here would most likely be the cause of what I was experiencing. After some more code reading I'm not so sure if function "BuildStashForSelectedSector" is the right place to fix it. Why not fix it where the item is placed in sector inventory? This would be function "MapInvenPoolSlots" (around line 1605). // HEADROCK HAM 5: A LOT of functions rely on these flags being set. So set them!! This should fix the problem reliably. A funny thing that I noticed while testing is that you can arm a bomb and place it in sector inventory in an unloaded sector. This doesn't make much sense to me because you never know where exactly it will be placed. This is not new but maybe we want to prevent that in the future (pampering players even more )? What do you think? This is a good idea (and my initial thought), but this approach requires more changes than clearing the bitfield once in BuildStashForSelectedSector. For instance, this patch to MapInvenPoolSlots only fixes the problem for items dropped manually from the cursor, but not for items placed there via 'W', 'E', Ctrl+Click, or sorting/filtering. The reuse of pInventoryPoolList slots was introduced in rev 6554 as a performance enhancement. This means that most inventory code was written with the assumption that these structs are clean. If this assumption can no longer be held, all code that touches pInventoryPoolList slots must take into account that the underlying data might be dirty. The usFlags bitfield is the most likely place for an unintended data corruption because this field is usually modified via '|=' or '&= ~', instead of wholly replaced by assignment. If the usFlags bitfield is the most problematic field and existing code expects that non-existant pInventoryPoolList slots have clear bitfields, then the most minimally invasive change is to also clear the bitfield when the slot is being cleared for reuse. tl;dr: Restore the assumption that usFlags == 0 in an "empty" pInventoryPoolList slot. Hope that makes sense. Thanks for reviewing this patch! I think that's right; the other "pipl->usFlags = 0;" is superfluous. I added it because I thought it might be confusing to have two styles of "clearing" a slot in the same function, but that would probably lead to cargo-culting later. A clear comment over the single change would be better. Unfortunately my original assumption is not true. The problem is that "uiNumberOfSeenItems" is not what the name implies. It's not the counter for items that we know of and that are visible. 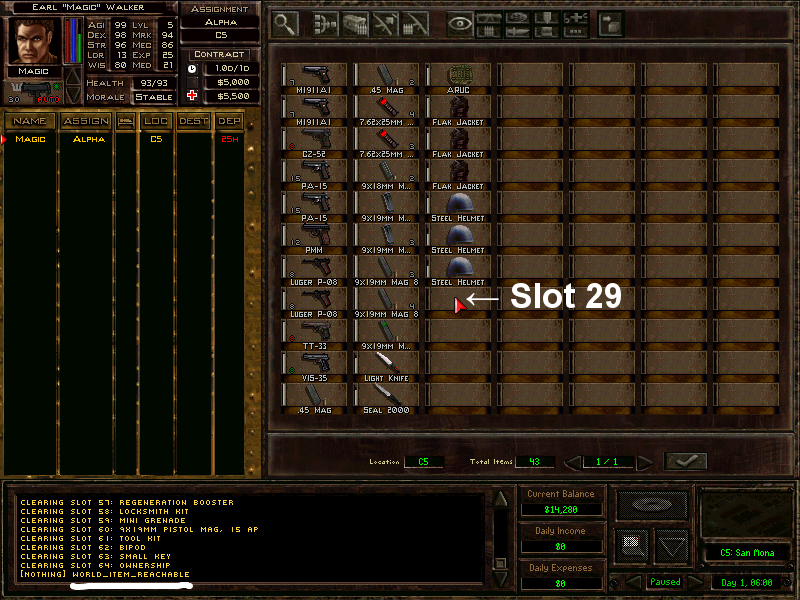 For unloaded sectors it holds the total number of items. The item list of an unloaded sector is not sorted which means that we can have a mix of seen and unseen items in the list. So my intention to decrease "uiNumberOfSeenItems" doesn't work because in this case the final for loop may overwrite seen items which are at the end of the initial list. Your fix is the best we have at the moment unless we find another solution that also covers all options. I may research this more. I committed your patch in revision 7552 (dev) and 7553 (stable). After all it's a good patch because it cleans the list of invalid flags and we do not have to fix a messy list in all the other places. Thanks again.